Here we will post updates, latest news, and miscellaneous information direct from our Dental office in Riverside CA by Peter Mani, DDS. You can get useful information about most dental stuff here. For example, if you had a tooth extracted today, you can look through our blog about how to care for a dental extraction. It is almost like a mini dental wikipedia or encyclopedia you can reference from the comfort of your home. Starting January 1st 2019, Linda Linda Risk Management dental insurance is starting a new dental PPO plan. We are proud to announce that we will be in network with LLU Risk Management dental PPO. We will be one of the exclusive offices in Riverside CA that will be in network with Loma Linda Risk Management. You will be able to get your regular check ups and cleanings convered by your insurance often at no cost to you! Loma Linda Risk Management sets the fees and we will be contracted and accept their fees. Even if you don’t live in Loma Linda, come see us in Riverside. We get Loma Linda employees from all over, Riverside, Corona, Redlands, Menifee, Murrieta, Lake Elsinore, Colton, Grand Terrace, San Bernardino and many more. Dr Mani turned 40 years old over the weekend. Happy Birthday!!! Back to work fixing teeth Monday! Here is another denture we completed. Our patient traveled from the mid-west to get his dentures. You can see the dramatic difference from before and after. He was suffering from missing teeth, gum disease, and cavities too. But now he can smile with confidence because of his new dentures. Photo used with patient’s consent and permission. It has been a while since we wrote on our blog. A lot has changed since our last post, including the biggest change: Dr Mani and his family have welcomed their baby daughter back in November of 2016. With the coming of the baby, Dr Mani has adjusted the office hours for baby bonding. Please visit our facebook page for our latest hours and work schedules. We have been busy making lots of dentures for our patients and taking care of our patient’s other dental needs. Although we know the schedule has been a little bit more booked up, we appreciate your patience as we accommodate everyone as best as possible. Our staff is at the office most days of the week to answer the phone, but if you get the voicemail, please leave a message and we will return it the next business day we are in the office. Thanks again and we look forward to seeing you soon! Here is an example of a patient who came to us to get an opinion about making dentures. The patient was complaining of loose teeth, difficulty eating, smelly breath, pain on biting. What the patient was suffering from was severe gum disease. We considered trying to salvage some teeth but every single tooth he had was loose and dentures was the only option he had. So we extracted all his remaining teeth and made him a set of dentures. At first he was very apprehensive with the idea of having dentures but when he looked in the mirror after it was all done, he was very happy with the result. There is a learning curve as far as getting used to dentures but the patient is well on his way to mastering dentures. In no time, he won’t even notice he is wearing dentures. This is indeed a life changing point in his life. He was embarrassed to smile before but now he can smile with confidence! Photo used with consent and permission from patient. Want to know the truth about dentures? A good quote I’ve always heard and believe in is “dentures are an alternative to having no teeth.” So if you already have no teeth then obviously dentures would be a good way to get teeth back in your mouth. But other examples would include gum disease, gross decay, missing teeth causing difficulty eating or chewing. In reality you want to try to avoid dentures if possible, however in some cases it is not possible to avoid dentures. Dentures can look great but it can take some time getting used to the feeling of wearing dentures. Often the upper denture is easier to use but a bottom denture will take effort on the patient’s behalf to be able to use. The reason is an upper denture has the surface area of the palate to help create retention/suction allowing it to stay in easier. The bottom denture doesn’t have as much surface area due to the tongue causing it to feel like it is popping or flopping up. The patient must practice wearing a lower denture and spend quite a bit of time coordinating the lip, tongue, cheek muscles to keep a lower denture in place. If a patient doesn’t put the time to practice wearing their lower denture they will not learn to use a lower denture. It is almost like an acquired skill like learning to ride a bicycle. The most common reasons people need dentures are gum disease and/or decay of the teeth. Below is a photo of a patient with decayed teeth which were beyond fixing. If your teeth are loose and wobbly where you are having a difficult time eating then you are a candidate for dentures. If your teeth have decay and cavities beyond being fixable then you are a good candidate for dentures. In fact if you are missing most of your teeth and only have a few teeth left on each arch where you have a hard time eating you could be a good candidate for dentures as well. Below is an example of a patient with missing and decayed teeth beyond fixing who was able to fix their smile with dentures. Photo is of an actual patient of Peter Mani DDS and photo used with patient’s permission and consent. This is the 2nd part of a our series on all about dentures. Here is a link to part 1. We have been busy this past year making dentures for our patients. I want to say we’ve made hundreds, if not thousands, of dentures in my years of experience. People have been coming from not only Riverside CA but from all over southern California to make dentures at our office. So we’ve decided to make a series of posts all about dentures, making dentures, denture repairs, anything and everything related to dentures. This post serves as an introduction to dentures. In this introduction to dentures we will outline about the process, deciding if dentures are right, and much more. In the series we will mainly be focusing on full dentures. Partial dentures is another topic we’ll have to cover in another series.So if you have been considering or thinking about full dentures, sit back and enjoy the posts coming in the next few weeks that may help guide you in the decision making process. Here is an example of a set of dentures made by Peter Mani DDS in our dental office in Riverside CA. Photo of actual patient of Peter Mani DDS, used with patient’s consent and permission. There was an article that discusses about the importance of brushing your teeth before sleeping. In the article it explains how the ADA (american dental association) recommends brushing your teeth at least twice a day. But we believe that brushing after every meal can be even more beneficial. Whenever you eat or drink, bacteria begins breaking down those foods and leave plaque on your teeth. That plaque sits on your teeth and damages your gums and teeth. Brushing your teeth disrupts the process preventing damage to your teeth and gums. If you don’t brush before you sleep, the bacteria, plaque have many hours to sit and destroy your teeth. Oh yeah, don’t forget to floss too. If you have questions about oral hygiene, brushing before you sleep, plaque or anything else discussed in this post, feel free to contact us at 951-687-8700. 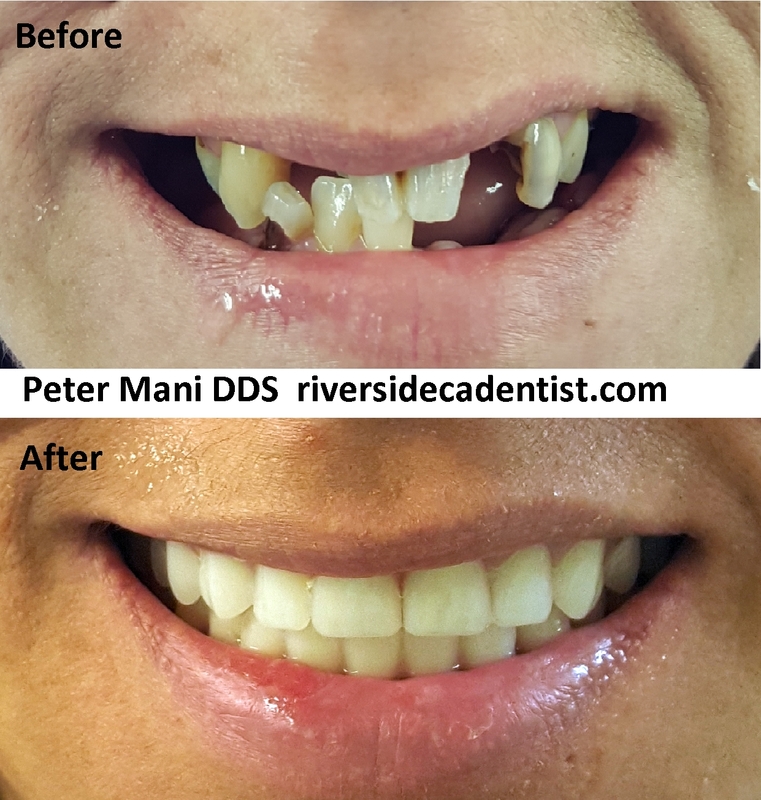 Peter Mani DDS is a general dentist in Riverside CA. Childhood tooth decay is a serious problem and is very common. According to this article by the BBC, tooth decay affects 12% of 3 year old kids. We are very sure these numbers are similar to what we see here in the Riverside CA area. Some tricks to preventing tooth decay in kids is always monitor what they are eating and drinking. A very common cause is kids who drink juice, milk, or soda. It is important if your kid is drinking anything besides water, to have them brush their teeth immediately after. Also having your kid’s teeth checked at least every 6 months can help prevent childhood tooth decay. Often it is not enough to tell your kid to brush their teeth. It is important the parent follows up and makes sure the teeth are clean. If you have any questions or concerns about childhood tooth decay or decay in children and you live in the Riverside CA area feel free to call us at 951-687-8700.